Jumbo paper shoppers have never been more convenient, strong and better looking than this before. Incredible Packaging Jumbo Kraft bag is just the perfect size for lunch, gifts, storage and so much more, It's the perfect way to show your clients that you care about quality. The top and the bottom of the bag are Cardboard Reinforced, and each bag comes with a Rope Style Handle. The bag Measurements are 18W x 7G x 18H. WHAT THIS BAG IS BEST FOR: This bag is best for Retail, Merchandise, Big lunch bag, Jumbo Shopping Bag, Restaurants, Take out, And to keep a Large amount of bread fresh. Check out our other craft bags to see what fits your needs the best! This bag has been tested for food safety. Square bottom for beautiful gift presentation: Incredible Packaging paper bags are designed with a firm and Square bottom, which makes them ideal for beautiful gift giving. Should it be personal or corporate gifts, this is the bag will give you beautiful presentation at every occasion. Easy to carry handle: Whether you choose to use our Craft bags for gifts, storage, groceries, or for any other occasion, you will always find our bags easy and a pleasure to handle and carry around. 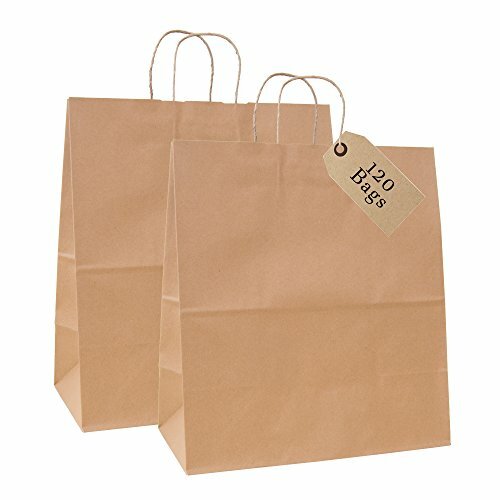 Reusable multiple times: When you buy our brown bags you can buy with confidence, knowing that as long as you store them properly, you can reuse them as many times as you like. This is especially helpful when using for grocery shopping or to keep your bread fresh. Super quality: Most paper bags are made of #60 Paper Weight, but Incredible Packaging paper bags are made of #80 Paper Weight. This means that our bags are super durable, so you will have to work really hard to tear it. EX- Large Size: Our beautiful Shoppers come in a big size, Which makes it perfect for Grocery shopping, Retail, Merchandise, Stores, Restaurants, And if course for a huge lunch bag. If you have any questions about this product by Incredible Packaging, contact us by completing and submitting the form below. If you are looking for a specif part number, please include it with your message.